During Navratri, Nine forms of Goddess Durga are worshipped by the devotees. Read further for Nine Days of Navratri Significance. Nine Days of Navratri - 'Navratri' is one of the oldest and most pious Hindu festivals in the country. This festival dates back to pre-historic era, much before the vedic period was established. The powerful effect of worshipping Adi Shakti was well recognized from early times. It is also mentioned in the Vedas that Ma Shakti was venerated for 'sadhana' or dedicated meditation. Rishis and advanced spiritual seekers practiced 'japa' of the powerful 'Gayatri' mantra during this period. Today, as one of the most celebrated festivals Navratri is a religious and cultural binding force in the composite milieu of India. The nine days Navratri celebration in a very significant way brings our country's rich folk tradition alive. The serene yet powerful puja during the nine days of Navratri is complemented by rich and vibrant festivities. 'Navratri' is a most opportune time when all parts of the country gears up for the festival. Maa Shakti represents the creative energy of the divine. Pilgrims visit the Shakti peethas for prayers and wish-fulfillment in this Navratri nine days festival. It is believed that nine days of Navratri assures protection and healing from any destructive force. With proper fasting, puja and self-disciplining habits, the devotee's wishes can be fulfilled. Navratri glorifies the power, intellect and wealth aspect of Ma Durga. Hence, the nine days are segregated into three-day sets to honour Ma Durga, Ma Lakshmi and Maa Saraswati, respectively. The significance of Navratri nine days festival is based upon the science of 'gunas' and the ultimate goal of attaining 'satvik' guna. Since Goddess Durga represents the amalgamation of all powers, her invocation allows the devotee to get rid of 'tamasic' quality or tendencies towards attachment and delusion. On the next three days, she is worshipped as Goddess Lakshmi for eliminating the 'rajo guna' or energies of passion and anger, with blessings of spiritual wealth or riches. During the last three days, Goddess Saraswati is venerated for knowledge, spiritual wisdom and intelligence. Once this knowledge descends on the devotees, he/she is able to overcome ignorance and develop pure 'sattvik' thoughts and intellect. In her nine manifestations during the nine days of Navratri, Ma Shakti is worshipped as Shailputri, Brahmacharini, Chandraghanta, Kushmanda, Skanda Mata, Katyayani, Kalratri, Maha Gauri and Siddhidatri. This Nava Durga aspect is mentioned in 'Durga Stotra' in the Vedas. It is also described in 'Chandipath', a sacred text dedicated to Ma Shakti. Invoking Nava Durga during the Navratri nine days festival eases the difficulties for the devotee on the path of spiritual upliftment. The names of the Goddesses are invoked with proper puja rituals, japas, hymns and 'arti'. First day puja is dedicated to Shailputri Devi, daughter of the Himalayas. She combines the power of Brahma, Vishnu and Shiva, rides a bull and stands for inspiration. The second day is devoted to Brahmacharini Devi, who epitomizes celibacy and penance. She symbolizes the arduous journey towards 'Moksha' or salvation. She grants devotees pursuing the spiritual path peace and divine bliss. 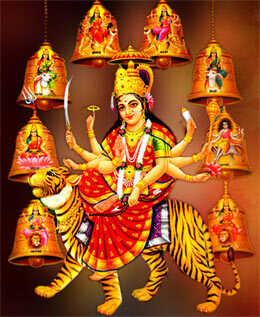 The third day is for invoking Chandraghanta Devi who is depicted as bearing a 'chandra' or moon on her head. Brandishing weapons and riding a lion, she epitomizes bravery and instills strength to her devotees. Kushmanda Devi is the fourth form who created the universe with her laughter and dispelled darkness. She has eight or ten hands and stands for austerity that purifies the soul. Devotees seek her blessings for darkness-dispelling light in their lives. In her fifth form as Skanda Mata Devi, the mother of the heroic warrior Skanda, she symbolises Divinity. Skanda Mata Devi is depicted as holding baby Skanda and offering her blessings. The sixth day is dedicated to Katyayani Devi, born to sage Kata as a fulfillment of his wishes after a long penance. She is depicted as seated on a lion with three eyes and four hands. In her seventh form, Kalratri Devi is depicted as a fierce and dark-complexioned Goddess holding a dagger to combat evil. She protects her devotees from evil and helps them overcome egoism. Mahagauri or the wife of Lord Shiva is depicted as extremely fair-complexioned, wearing white clothes and holding a trident and 'damru'. She represents peace, intelligence and wisdom. In her ninth form as Siddhiratri Devi, she bestows supernatural powers. It is believed she bestows all the eight siddhis to rishis, sadhaks and yogis who please her. Lord Shiva attained his 'Ardhnarishwar' (half male, half female) form by doing penance to acquire all eight siddhis. She is depicted as seated on a lotus in a state of bliss.